Here are some new ideas for how to use the vegetables in this week's share. Plus, a great photo and story below from a CSA Member who had a wildlife encounter while at the farm. Have an idea to share? A recipe for a certain vegetable you're wanting? Leave it here in the comments or shoot me an email. CSA member Bonnie suggests this Creamy Swiss Chard Pasta that she made and enjoyed. If you still have collards, Bonnie also recommends this recipe for Kickin' Collard Greens. I'm planning to try this one myself tonight, as we have a big bag of them that need to be used up. Nichole shared this link from Saveur magazine, which has compiled a bunch of ideas for zucchini. I've personally been eyeing this Shaved Summer Squash Salad from Bon Appetit, which looks light and fresh. And of course there are more ideas in our archives for zucchini, squash, chard and greens. Here are a few recommended recipes from CSA members that I received over the last week. If you have a recipe to recommend, or want to submit a photo, email me anytime. (As an aside, photos don't have to be professional. The one above is one that I snapped on my phone and then doctored with an app called Instagram). And now, here are some ideas for Cabbage, Greens and Chard. Angela made and loved this recipe for Sweet and Spicy Pork and Napa Cabbage Stir Fry with Spicy Noodles that she found at AllRecipes.com. She substituted fish for the pork, but also believes that it would be a great vegetarian dish, too. Laura recommends two Cabbage recipes: Stuffed Cabbage from Smitten Kitchen and a Chinese Cabbage Salad that she says is great. Deborah, on our Facebook page, recommends this recipe for Southern-Style Crock Pot Greens. It can use collard or turnip greens (or both). Remember, that the greens on our turnips are edible, as are the greens on your radishes. "This is a recipe from the book Animal Vegetable Miracle by Barbara Kingsolver. Her family ate a whole year using essentially only products from their farm or produced locally. They provided recipes for seasonal vegetables throughout the year in the book and provide them on their website. This one [for Swiss Chard] is called Eggs in a Nest and is a tasty way to use Swiss chard, though I use sun-dried tomatoes in oil instead of dried ones." I must admit something to you, our farm community: after our first few weeks of shares, I had a Vegetable Crisis. Yes, even farmers can flinch in the face of such awesome kale poundage. In the fall, I enjoy sauteed kale with butter and white wine but right now, as summer sidles in for its extended visit, I wanted something delicious, refreshing, and away from the stove, but I found myself momentarily stumped. The key to this slaw is slicing the kale thinly, no more than a ¼ inch wide and thinner if possible. This is easiest if you stack the de-ribbed leaves and roll them up to make a long kale “cigar” before slicing through the whole stack. The vegetable should look like green spaghetti. Let sit for at least an hour so the kale softens up a bit and the flavors can mix. If you are adding a softer cheese like goat cheese, you may want to mix it in just before serving so it doesn't fall apart too much. What do you plan to do with your kale? Share your ideas in the comments! • Whisk together Honey-Lemon Vinaigrette in the bottom of a large bowl. • Remove ribs and thinly slice kale into strips no more than ¼ inch wide. • Add kale, onion, olives, and crumbled or grated cheese to bowl. • Toss with dressing and taste to adjust seasoning. Whisk together garlic, herbs, lemon juice, and honey with some salt and pepper. With ample servings of kale and collards in our first two shares, I wanted to offer up a few recipe ideas for how to use them. Bring a pot of water to boil. Boil the collards and kale for 10 minutes. Remove to a bowl, reserving the cooking water. In a wide skillet, heat butter. Sauté a diced onion until lightly browned and soft. Add the collards and half of the cooking liquid. Sauté for 30 minutes, until greens are very soft. In the last 10 minutes of cooking, add a teaspoon and sugar and a tablespoon of red wine vinegar. Serve. They were delicious and went perfectly alongside a grilled entrée. How are you using kale or collards? Do you have a favorite recipe? If so, please share it in the comments! I found this recipe last year in the Washington Post Food Section. It was originally published using spinach, but I've found that any greens will work - Kale, Collard, Swiss Chard, etc... I like it when I can use as many things from a week's share as possible. You'll notice this recipe uses garlic, cilantro, onion and greens - all things in this weeks share! This is a great mid-week meal and can be ready in 30 minutes. Replace the shrimp with grilled/sauteed chicken or tofu for a vegetarian option and serve with white or brown rice if you want some carbs. Use a spoon to peel the ginger; mince the ginger and the garlic, keeping them in separate piles. Finely chop the onion; there should be about 3/4 cup. Chop the cilantro leaves, discarding the stems. Wash and stem the spinach, then coarsely chop; the two can be mixed together. Drain and rinse the chickpeas; cut the lemon half into 5 wedges. Toss the shrimp in a medium bowl with 1/2 teaspoon of the salt. Heat 2 tablespoons of the oil in a large nonstick skillet over medium-high heat, until the oil shimmers. Add the shrimp and cook for about 2 minutes, or until the bottom side is pink. Turn them over and cook for 1 to 2 minutes, until not quite cooked through (still a little translucent in the center). Transfer to a plate and squeeze 1 of the lemon wedges over the hot shrimp. Return the skillet to the stove, reducing the heat to medium. Add the remaining 1 tablespoon of oil, then add the onion. Sprinkle with salt to taste (a big pinch, if possible) and cook, stirring once or twice, for about 5 minutes, until the onion starts to brown. Add the ginger and garlic and cook, stirring constantly, for 1 minute, then add the cumin and cayenne pepper. Cook, stirring, for 20 seconds, then add 1 3/4 cups of the water, the chickpeas and the remaining 1/2 teaspoon of salt. Increase the heat to medium-high and cook uncovered, stirring occasionally, for 5 minutes; the mixture will be fragrant. Use a potato masher to crush about half of the chickpeas in the skillet, then add the spinach and cilantro. Use tongs to fold them into the mixture; cook for about 2 minutes, until they have wilted. Return the shrimp to the skillet, along with any accumulated juices. Cook for 1 to 2 minutes, adding the remaining 1/4 cup of water if needed, until the shrimp is reheated, opaque and just cooked through; be careful not to overcook. Remove from the heat; taste and adjust seasoning as needed, including a finishing pinch of cumin, if desired. Divide among individual bowls and serve with the remaining lemon wedges on the side. Adapted from "Fine Cooking Annual, Vol. 2," from the editors and contributors of Fine Cooking magazine (Taunton Press, 2008). Here's a few recipes that might help if you have some veggies lingering in your fridge from previous shares. Deborah Starobin-Armstrong prepared this for us a few years ago. I can't remember if I've posted it already, but if I have, it's worth repeating. Put the eggplant, green pepper, onion, mushrooms, garlic and oil in a skillet. Cover and cook gently ten minutes, stirring occasionally. Add the remaining ingredients and mix well. Simmer, covered, until the eggplant is tender, about 30 minutes. Put in a dish, cover and chill in the fridge overnight to blend the flavors. Serve on lettuce leaves. Kay Marlin sent us her version, below, to add to Gail's earlier suggestions for green tomatoes. This is how I did my last batch of fried green tomatoes. For the breadcrumbs: use good Italian bread, or a stale baguette that hasn't gone hard as a rock. Crumble the bread (I use a little food processor). Add a bit of salt, crumbled dry oregano and thyme, black pepper, parmesan cheese, and garlic (if you want it). Heat a pan with non-stick spray and lots of good olive oil. Slice the tomatoes about a quarter of an inch thick, maybe a little bit more but not too thick. To really make the bread crumbs stick, you can dip each slice first in a beaten egg. Coat each slice well, both sides, with the bread crumb mixture, and add just enough slices to fill the bottom of the pan, don't overlap them. Keep the heat high and add oil as needed. The slices will stick, there's no way that my cooking ever turns out the way it does on TV cooking shows. But I just scrape up those overcooked crumbs and eat 'em. I don't know how long to fry each side, I do it by looks, but I think if you turn the slice and it hasn't gotten browned and a bit crunchy, then you let the second side stay longer. Some people would tell you to put the slices on a paper towel before serving, I say eat the oil, it's delicious. But you want something to soak it up, serve your tomatoes with a nice rice on the side, or a piece of chicken if you eat meat. Thanks to Carole Grunberg for passing this recipe to us and including her suggestions in parentheses. 1/2 c. white wine (or 2 T lemon juice) - the wine makes this better! In large pot (cast iron works fine), saute onions + garlic in oil for 4 min over med-low heat. Add potatoes, rosemary, broth, salt. Cover & bring to boil. When it boils, add beans & wine, reduce heat, cover & simmer about 10 min or until potatoes are tender. As potatoes cook, rinse, drain, chop arugula. When potatoes are tender, add basil, salt & pepper to taste, remove rosemary sprig (ok if some leaves remain in soup). Put handful of arugula in bottom of soup bowl, ladel soup over & top with grated cheese. invite your friends over! The beautiful leaves of the kale plant provide an earthy flavor and more nutritional value for fewer calories than almost any other food around. Although it can be found in markets throughout the year, it is in season from the middle of winter through the beginning of spring when it has a sweeter taste and is more widely available. Kale is a leafy green vegetable that belongs to the Brassica family, a group of vegetables including cabbage, collards and Brussels sprouts that have gained recent widespread attention due to their health promoting, sulfur-containing phytonutrients. It is easy to grow and can grow in colder temperatures where a light frost will produce especially sweet kale leaves. So now you’re informed on the kale front, but have you spent time getting to know some of the wild bounty growing at Clagett? Last week some gals introduced me to Lamb’s Quarters which just took hold near the kids’ pizza garden. (Ask Carrie). This green is good cooked or raw and when the leaves are tossed in a salad they have a nice nutty flavor. Place the sesame oil and water in a large skillet, bring to a boil steam the kale for 5 minutes, covered (of course). Add the garlic scapes, lamb’s quarters and steam 2 more minutes. Stir in the ginger root, garlic, cayenne and soy sauce. Below are a slew of recipes for kale and collards to play with and keep in your files. that remains. Coarsely chop the kale. Very finely chop anchovies together with the rosemary. thoroughly coat it with the oil. Stir in the beans. Cook for 3 minutes. until the pasta is tender. Adjust the seasoning, if necessary. Pass Parmesan cheese at the table. Makes about 5 cups (1.25 liters); 4 first-course servings. Wash and trim the greens, chip roughly, and cook until tender in a little olive oil. Peel and the dice the onion. Peel and chop the garlic. Dice the bacon (if using sausage or celery, cut it into chunks) and saute it in a tablespoon of olive oil. When it has begun to render its fat,add the onion and cook until softened, but not too brown, about 2 to 3 minutes. Add the garlic, stirring quickly to prevent it from burning. Remove from the heat and add to the corn bread. Finely chop the leaves of the thyme and sage; there should be about 1/2 teaspoon each. Finely chop enough parsley to make about 2 teaspoons. Add the herbs; the cooked greens; the egg, lightly beaten; and the milk to the bowl with the corn bread. Mix well. Add more milk if the mixture looks too dry. Season with S & P. Makes 4 cups, enough for 2 chickens. her vegetable cooking water to feed those guys. Yes I DO mean Chop Chop. You know how chow chow made it. So you take whatever the harvest is for the week and you coarsely chop it up and toss. Voila-speedy, simple, fresh! Place the clean produce in a food processor and coarsely chop. Add the herbs last. The Chop Chop keeps best refrigerator “naked” and will last for a few days. Drizzle with citrus and olive oil just before serving or toss with Clagett Vinaigrette. In a skillet, over medium heat, toast the sesame seeds in the oil until they begin to pop. Quickly add onions and garlic and sauté until the onions begin to soften. Add cabbage, green chard, beet greens, and turnip tops. Sauté until greens begin to wilt. Add sesame oil and sauté, stirring to mix flavors. Add salt and pepper to taste. Cabbage should be al dente and greens wilted. Serve with roasted fowl or favorite veggie entrée. 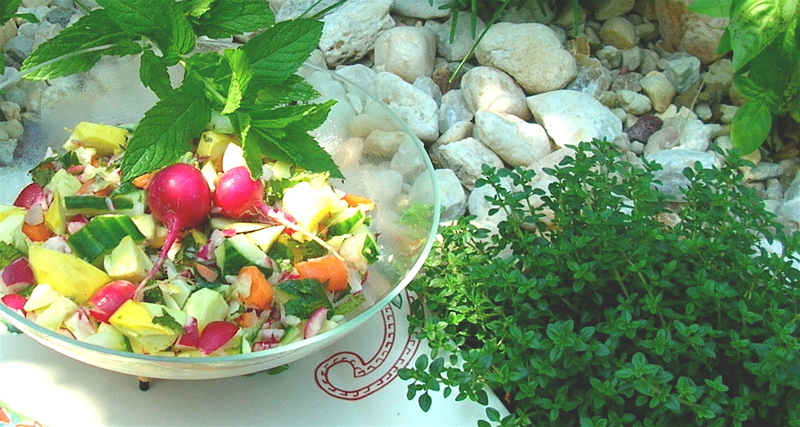 Place all of the vegetables and herbs in a large bowl. Mix all dressing ingredients until very smooth. If you use tofu, mix in food processor, blender or with an egg beater. Taste and adjust seasonings. Combine well and chill. (Best eaten within 2 days). Strawberries are the food of the week. Did you know that strawberries contain unique phenolic phytonutrients that serve as potent antioxidants, which have repeatedly been shown to help protect cell structures in the body and to prevent oxygen damage in all of the body.s organ systems? Phenols not only make strawberries a heart-protective fruit, but an anti-inflammatory one as well. Like non-steroidal anti-inflammatory drugs, such as aspirin or ibuprofen, phenols block the enzyme cyclo-oxygenase (or COX) whose over activity has been shown to contribute to unwanted inflammation, such as that which is involved in rheumatoid and osteoarthritis, asthma, atherosclerosis, and cancer. Specific phenolic compounds known as anthocyanins also provide strawberries with their beautifully characteristic red color. Heat oven to 350 degrees. 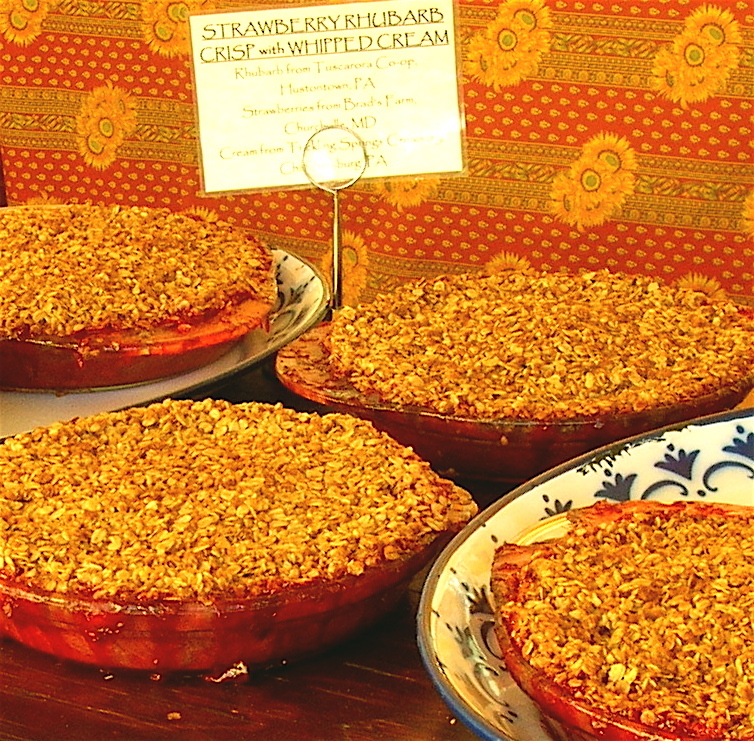 Place strawberries and rhubarb in ungreased pyrex pie plate or baking dish, 10 x 6 x 1-1/2 inches. Sprinkle with salt. Measure sugar, flour and cinnamon into bowl. Add butter and mix thoroughly until mixture is crumbly. Sprinkle evenly over fruit. Bake 40 to 50 minutes or until topping is golden brown. Serve warm with whipped cream. This 10 minute dessert combines our favorite flavors in a quick and easy way that is rich tasting, yet healthier than many desserts. The chocolate is a great complement to berries and yogurt. Fold together yogurt and berries. Melt chocolate in a double boiler with heat on medium. Place berries and yogurt in individual bowls and drizzle with melted chocolate. * For a more formal presentation you may want to pour a pool of yogurt on a plate and place berries on top of pool. Drizzle chocolate over berries. Clagett Farm Recipes~ Let’s Start With Dessert! Before we lead you to dessert we want to chat about “herb motivation”. A friend shared the theory that he builds his meal around the fresh herb du jour. That sounds like a good old world theory to us so why not take a look to the abundant dill or few kinds of mint or many other green goodies. They are there for the pickins’ after all! The sauce for this recipe is a Japanese tradition and if you have experienced it, you would drool for the recipe. It is a perfect blanket for the sprightly Chinese cabbage in this week’s harvest. Place all ingredients except canola oil, chives and cabbage in a blender or food processor. Process until smooth while drizzling in oil. Drizzle the Carrot Miso Sauce over the cabbage wedges and serve topped with a sprinkle of garlic chives. In Spain this dish is a tempting and healthy standard. You can try various greens such as Swiss chard or try adding some of Clagett’s spicy greens. In a large, straight-sided skillet, heat the olive oil over medium heat and add the bacon. Cook, flipping occasionally, until the bacon is golden and crisp, 6 to 8 minutes. Transfer to a plate lined with paper towels. Add the 3 whole cloves of garlic and the bread to the pan, and sauté until the garlic is tender and golden and the bread is deep golden brown on both sides, 4 to 5 minutes. Using tongs or a slotted spoon, transfer the whole garlic cloves and 4 of the toasts to a mortar (or a small food processor). Set aside the remaining 2 slices of toast on a paper towel. To the same skillet, add the 3 cloves chopped garlic, the cumin, and the paprika. Cook, stirring, until fragrant and the garlic begins to brown, 15 to 30 seconds. Increase the heat to medium high and immediately begin adding the spinach in batches, stirring to wilt. When all the spinach is in the pan, add the chickpeas, 1 cup water, 1 tsp. salt, and several grinds of black pepper. Bring to a simmer. Meanwhile, mash the bread slices and garlic in the mortar or process in the processor (don't mash the 2 reserved toast slices) with the vinegar and 1 to 2 Tbs. water until puréed. Stir the mashed bread mixture into the spinach, lower the heat to medium, and simmer until the liquid has reduced almost completely but the spinach is still moist, about 10 minutes. Crumble the bacon and stir it in. Taste and add more salt or vinegar if needed. Crumble the reserved toast over the spinach. Serve hot or warm. From the book Feeding the Whole Family, by Cynthia Lair, Moon Smile Press, 1998, reprinted with permission, available from Amazon.com. •	In the morning, combine all ingredients from marinade. •	Cut tofu into 1/2" slabs, then cut slabs into triangles. •	Put marinade and tofu in a glass storage container with a tight-fitting lid and refrigerate 4-8 hours. •	Heat oil in a skillet. Place marinated tofu pieces in oil and brown on both sides. Set aside and prepare greens. •	Bring 2 quarts of water and 1/2 teaspoon of salt to boil. Submerge greens. Boil for 7-10 minutes. •	Pour cooked greens into a colander in the sink. Let cook. Squeeze out excess water with your hands and chop into bite sized pieces. •	Bring a large pot of water to boil and cook udon noodles, according to package directions. While noodles are cooking, prepare sauce. •	Put all ingredients in a small pan on low heat. Using a whisk, mix ingredients until smooth and warm. •	Add extra water for desired consistency. Serve noodles with cooked greens and browned tofu on top. Drizzle sauce over all. 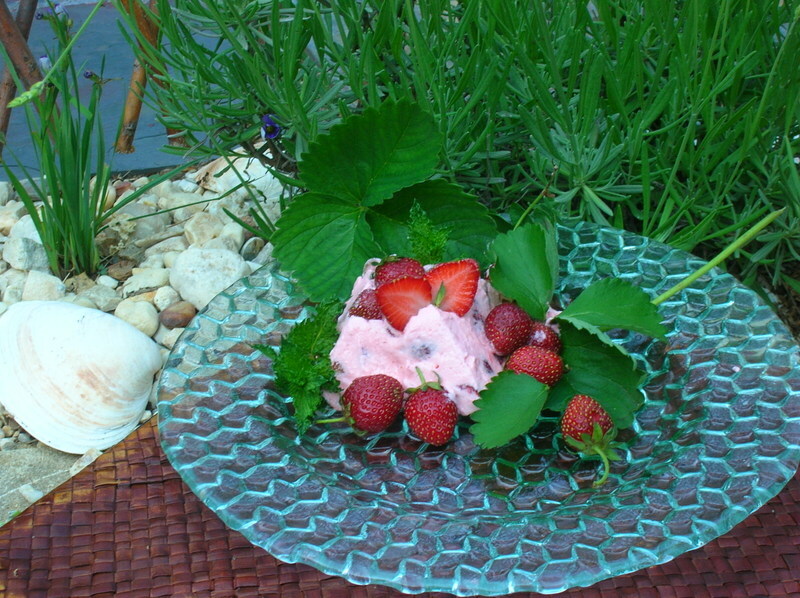 Simple and sumptious, this is a lush dish for expanding those extra extra extra sweet Clagett strawberries this season. Cooks' note: Panna cotta can be chilled in molds, covered, up to 2 days. Blend strawberries, buttermilk, and sugar in a blender until very smooth. Sprinkle gelatin over milk in a small bowl and let stand 1 minute to soften. Bring cream to a boil in a small saucepan. Remove from heat and add gelatin mixture, stirring until dissolved. Whisk cream mixture into strawberry puree and pour into molds. Chill molds, covered, until firm, at least 8 hours. Dip molds in a small bowl of hot water 2 or 3 seconds, then invert onto dessert plates and remove molds. Let stand at room temperature 20 minutes to soften slightly. Halve strawberries lengthwise if small, or quarter if larger. Whisk together orange juice and superfine sugar in a bowl until sugar is dissolved and add strawberries, tossing to coat. Set the compote aside to macerate for 10 minutes. Serve panna cotta topped with fresh strawberies and mint. Number One item: It's great to be back in touch with ya'll after what seemed like a long drawn-out winter. We were really just waiting to get back to the farm for some good "Farm chit chat"! We bet you didn't realize that those spicy somewhat bitter greens such as the “spicy mix” containing peppery arugula or watercress pack a whollop of nutrition. It has been said by an Indian chef that Americans need to be converted to the "bitter" taste. So load up and blend these greens with milder ones. I overhead a mom saying she spreads peanut butter on just the stems of bok choy to feed her 6 & 7 year old children. The bok choy is finished before they realize it’s not celery. Since local is important, as well as organic, I will attempt to bring you recipes with suggestions and sources for locally and sustainably-produced products. Place the walnuts on a greased microwave safe plate. Drizzle with honey and toss. Sprinkle lightly with salt. Microwave for 2-3 minutes, tossing every minute to coat. Spread warm nuts on wax paper in a single layer to cool. To make the Vinaigrette: in a small food processor, combine all ingredients and blend for 45 seconds to 1 minute until emulsified. Line plates with greens. 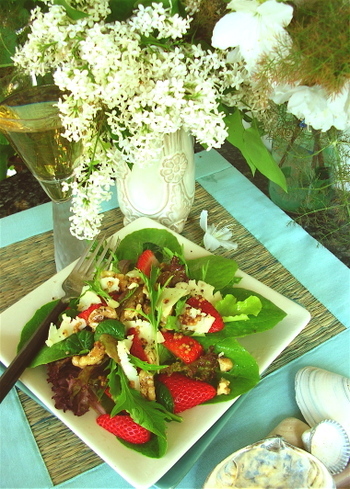 Top with strawberries, walnuts and cheese shavings. Drizzle with vinaigrette. 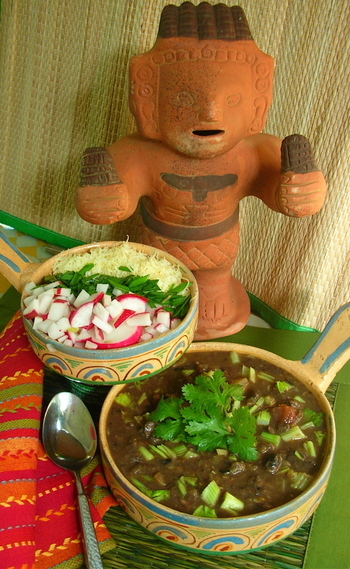 Half of the black beans in this spicy soup are pureed with tomatoes, the other half are simmered with carrots, onion and other veggies. In large saucepan, heat oil over medium heat; cook onion, garlic, and carrots, stirring occasionally, for 5 minutes or until onion is softened. Add chili powder and cumin; cook, stirring, for 1 minute. Add stock, 1 can of the beans. Meanwhile, in food processor or blender, puree together tomatoes and remaining can of beans; add to pot. Reduce heat, cover, and simmer for 10 to 15 minutes or until carrots are tender. Finally, add salsa and black pepper. Serve with your choice of toppings. Mix tuna, celery, walnuts, parsley, onion, salt and pepper. Blend dressing ingredients in blender adding oil a little at a time at end (to incorporate.) Blend well to make sure sunflower seeds are ground. Mix desired amount of dressing with tuna mixture. Serve on bed of chopped romaine lettuce with chopped radish. One Straw Farm is an organic “outreach” place with one fiesty “Lady Joan Norman” as half of the farmer team. Rumor has it that her Swiss Chard Burritos are incredible. Here is the base recipe for using your choice of greens. Also use corn or flour tortillas as you prefer. Preheat the oven to 375 degrees Sauté the greens in oil and garlic. Make a cheese sauce with milk, cheese, flour and butter. Mix cheese sauce into greens. Place the mixture into a tortilla, roll and place onto a greased baking dish. Cover with salsa and bake @ 375 for 20 min. This makes a generous amount of pesto, so use half and freeze the rest for the next time you make risotto. Prepare the spinach and herb pesto -- Put the spinach and herbs in a food processor or a blender. Process, adding a little stock to loosen if needed, until well combined. The pesto should resemble a very thick soup. Set aside. Make the risotto -- Bring the stock to a boil; reduce to a simmer. In a medium, heavy-gauge saucepan over medium-high heat, melt 2 Tbs. of the butter. Stir in the rice, toasting just until it starts to sizzle and pop, about 1 min. It should not color. Add the onion, stirring constantly, and cook until translucent, 1 to 2 min. Stir in the wine. When almost all the liquid has disappeared, after about 1 min., add just enough hot stock to cover the rice. Lower the heat to maintain a vigorous simmer; stir occasionally. When the stock is almost gone, again add enough stock to cover the rice, along with a pinch of salt. Check the risotto every 3 or 4 min., giving an occasional stir to make sure it isn't sticking to the bottom of the pan, adding just enough stock to cover the rice when the liquid has almost disappeared. Continue this way until the rice is just al dente, about 20 min. total cooking time. Bite into a grain; you should see a white pin-dot in the center. Take the risotto off the heat. Add the remaining 1 Tbs. butter. Stir in half of the herb pesto (freeze the rest for another time) and the cheese. Stir vigorously for a few seconds. The risotto should be moist and creamy, not runny. Add more stock to loosen the risotto if you like, and more salt to taste, if needed. Serve immediately.